In only 11 months, the general contractor IE Food built a completely new production plant for Meiereigenossenschaft e.G. Viöl. Over 105 million kg of raw milk from 136 dairy farms are processed here annually. 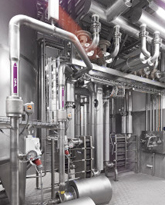 The plant equipment for the entire process chain was installed by Tetra Pak Processing. Only 2–3 workers are needed per shift for the operations to achieve this high production output. Numerous process sensors from Anderson-Negele help ensure that all steps during production and cleaning management are highly automated and run with a superior degree of efficiency, safety and reliability. Following delivery, the milk is cooled and stacked in a tank storage with a capacity of 825,000 kg. It is then separated, heated and processed into concentrate and cream in a 35,000 l plant. The planning of the entire system focused on creating a solution that combines efficient operation with ecological sustainability. 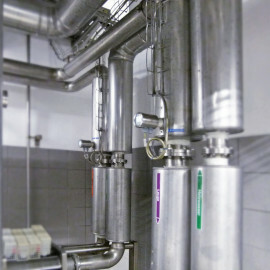 For example, the exhaust condensate is processed in a company-operated biological treatment plant. All processes are subject to a high degree of automation. The production steps and the corresponding CIP cleaning processes are monitored continuously for temperature, conductivity, flow rate and turbidity with hygienic, high-precision sensors from Anderson-Negele. A total of 60 temperature sensors of the TFP series provide for precise monitoring of all temperatures required for quality assurance in all process steps. The sensors comply with the “Hygienic by Design” principle and thus feature a hygienic and easy-to-clean installation configuration. In sensitive areas, variants with 2x Pt100 have a self-monitoring function. 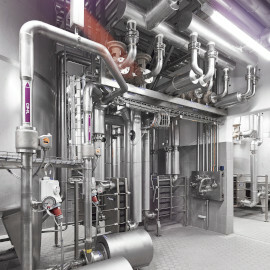 The sensors are designed for high continuous temperatures and thus achieve a very high service life even under regular exposure to CIP/SIP processes.The CIP cleaning process itself is supported by conductivity sensors of type ILM for a precise phase separation and a needs-oriented adjustment in the acid/base concentration. This makes it possible to avoid losses by preventing lines from being switched between cleaning agent and water prematurely or too late and prevents the consumption of excessive amounts of cleaning agent. The turbidity measurement operates on the basis of the backscatter method. The sensor is installed in a front-flush position and retains its precision due to the resistant sapphire optics.The phase separation for the lowest possible losses of the various end products and CIP media is achieved in Viöl using combined turbidity and conductivity measurement.Measuring instruments of the ILM (conductivity) and ITM (turbidity) series are used. The achievement of efficient operation combined with ecological sustainability was the core objective in designing the plant. Reliable monitoring of product flows during the CIP cleaning process, for example, is achieved by flow sensors of type FWS based on the ultrasound principle. 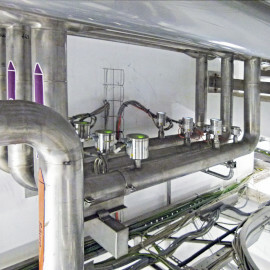 When treating exhaust condensate, a precise measurement of the flow rate is necessary for controlling the company-owned, biological treatment plant. Due to the high purity of the condensate that remains after the evaporation phase, ultrasound or magnetic-inductive methods, for example, cannot be used. A precise and yet cost-effective solution is the turbine flow sensor HM-E. A rotor in the housing is caused to rotate by the liquid flowing through it, and the rotating speed can be inductively determined with a high accuracy without requiring further contact with the product. Thus, this medium can be easily monitored and all stipulations for wastewater treatment can be complied with at a very low investment cost. The plant successfully achieved the goal of attaining efficiency with a minimized ecological impact.